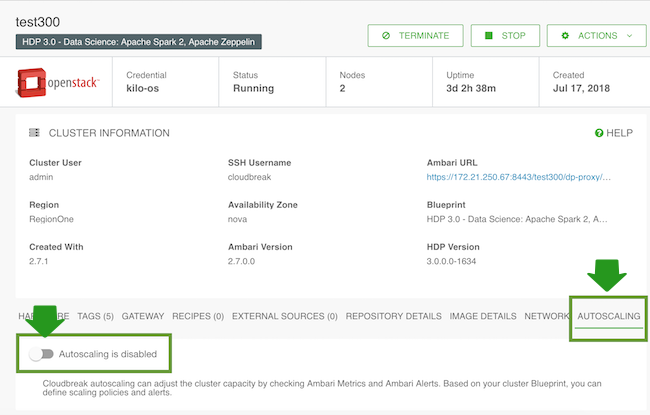 For each newly created cluster, autoscaling is disabled by default. You can enable it once a cluster is in the running state. Autoscaling configuration is only available in the web UI. It is currently not available in the CLI. On the cluster details page, navigate to the Autoscaling tab. The toggle button turns green and you can see that “Autoscaling is enabled”. Define alerts and then define scaling policies. You can also adjust autoscaling settings. If you decide to disable autoscaling, your previously defined alerts and policies will be preserved.